For special occasions, busy days, or days spent outside in the sun and water, braids and fancy up-dos are popular hairstyle choices. These styles can help keep hair out of your face and under control, reduce tangles, and add a special dimension to your look for a special event. Unfortunately, however, these styles can also lead to hair strand breakage or weakening, split-ends, and premature hair loss. With the right technique, however, you can pull off these styles as often as you please and protect your locks at the same time. Braids, or hair weaving, can lead to hair strand damage if they are worn for too long, too tightly, or if the braid is too heavy. Heavy braids put unwanted pressure on the hair root that can result in the pulling out of the hair strands. Tight braids can not only lead to hair loss, but the tight weave can also cause hair strand breakage, especially if the tight weave is in place for many days at a time. In order to get the braided look you want without the hair damage you should choose looser versions of the braided style. French braids are a great alternative to single hair braids because the weave pattern is softer and looser, thus reducing the pull on the hair roots. Chunky, multi-sectioned hair braids are a great alternative to small, tightly woven full scalp braids for the same reason. Finally, braids that start at the base of pigtails or a ponytail are safer than braids that start at the crown because the thickness of the section of hair protects against root pressure. Another way to make sure that your braid is hair friendly is to choose the braid closure wisely. Rubber bands will hold the strands tightly and cause breakage and split-ends. Kirby grips or other tight clips can also damage the hair shaft. The safest types of braid closures are cloth covered elastic bands, ribbons, and scrunchies. 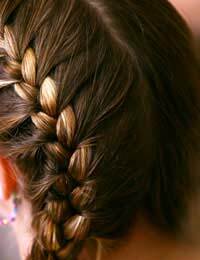 Every one loves the look of piled high hairstyles that cascade curls and hair ornaments. But, these beautiful hairdos can put too much pressure on the hair root causing hair strands to be pulled out prematurely. And, the more intricate or tight the style, the more chance there is of hair strand breakage or damage. So how do you get a beautiful up-do without harming your hair? Simply swap your favourite styles for more hair friendly versions. To recreate a bun that is less harmful to your hair follow the same steps as you normally would but the lower the location of the knot by a few inches. This nape bun, or bun that is located at the base of your skull, will not have to be secured as tightly as a centred bun, thus reducing the pressure put on the hair roots. For a hair friendly curling up-do you have two choices. For both styles you will need to start with a head full of curls. For straight heads of hair, hot rollers or a two-inch barrelled curling iron will create the most voluminous curls. Once curls are in place you can either separate your hair into two sections; one section will include the top portion of your hair and one will gather the bottom section, or three sections; one section is the left side area of hair, one section is the right side, and the third section is the back, bottom portion of your hair. For either style twist a cloth-covered elastic band around the sections to form ponytails close to the crown of your head. Once the ponytails are in place you can twist the top portions into small buns and leave the bottom portions of your curls hanging free to cover the crown of your head and the ponytail bottoms. Spray in place and kirby grip any stray hairs. Or, you can wrap a small portion of your hair around each elastic band to hide the closure and use kirby grips to secure the rest of the tresses in a flowing cascade of curls. For the most hair friendly up-do, however, you should try a half up half down look. For this hairstyle you will need to curl your hair just as you would for an up-do. However, instead of pulling all sections of your hair into a high ponytail you will only pull up a small portion of both sides. The rest of the hair will be left free and flowing to showcase the curls. With the secured top portion you can use either of the techniques mention above. No matter which type of hairstyle you choose, even if it is a tight, high setting up-do, you can still take steps to protect your hair from damage. First, never leave a tight or heavy style in any longer than necessary. Second, if a style does put pressure on the hair root add a few clips or kirby grips to help support the weight and reduce the pressure. Finally, adjust or loosen slightly any hairstyles that you can actually feel pulling on your scalp.